Your Niagara Falls experience starts the moment you board the climate-controlled bus at your hotel. You'll be taken on a tour that is guaranteed to stimulate your senses and leave you with memories that will last a lifetime. The tour includes free time to explore Niagara falls and Niagara-on-the-Lake and a local winery visit for wine tasting. After pickup from your Toronto hotel, you will travel by a climate-controlled coach to the historic Niagara-on-the-Lake, where you'll stop to shop and sightsee. 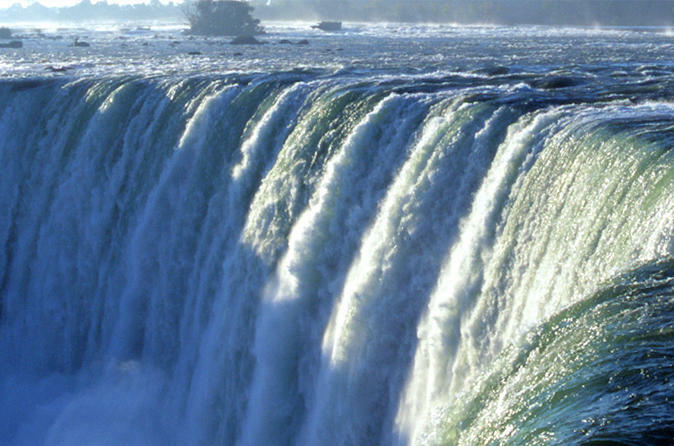 Continue to Niagara Falls to enjoy free time to experience this majestic site. Here you can enjoy a meal overlooking the falls, take a Hornblower boat tour, experience the Journey Behind the Falls, take a helicopter tour over the falls or enjoy an exciting ride on a jet boat. Test your luck at Fallsview Casino or Casino Niagara, check out the Butterfly Conservatory or Niagara Falls Aviary, have some fun at Clifton Hill, or climb the Skylon Tower (all activities at own expense). You'll also visit a winery for wine tastings. As you drive, enjoy informative and entertaining commentary and stop periodically for photo stops. Upon return to Toronto, you'll be dropped back off at your hotel.